The United States is helping Oman militarize its border with Yemen, trapping refugees from the U.S.-backed bombing of the country. The coalition frames its war as an intervention on behalf of Abdrabbuh Mansur Hadi, the man they recognize as the legitimate president of Yemen. Saudi Arabia and the UAE claim to be targeting the Houthis, the opposition group on the other side of Yemen’s civil war that controls the country’s capital, and that has alleged ties with Iran. The images from the school bus attack, however, reveal the actual targets of the coalition’s air power. From August 5 through 9, a unit of the Wisconsin National Guard that was assigned to U.S. Army Central conducted a week-long training with members of the Royal Army of Oman’s Border Guard Brigade in Haima, Oman. The exercises were part of Oman’s militarization of its border with Yemen — with funding and other assistance from the United States. In other words, not only is the United States. helping the coalition bomb Yemeni civilians. It’s helping trap the refugees fleeing that bombing. Before, it was clear that the American government wanted no Yemeni refugees in the United States. 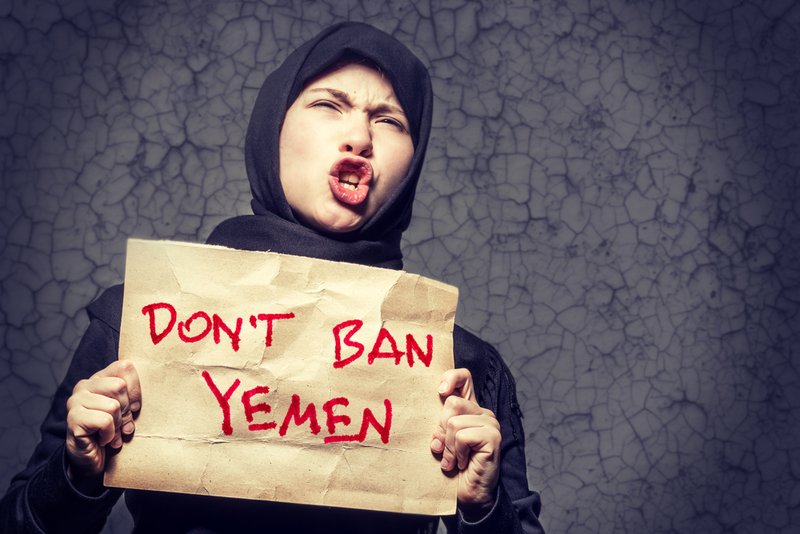 Yemen has been listed in all three iterations of the Trump administration’s anti-Muslim travel ban. That was unjust enough. In Oman, the United States is helping to prevent Yemenis from leaving their country at all. Remarkably, despite the nightmarish conditions that the United States, Saudi Arabia and the UAE have made in Yemen, it’s also the case that more than 280,000 people—mostly from the Horn of Africa—have sought refuge in Yemen. The measures that the United States is supporting with its allies, then, are not only devastating Yemenis. The cruelty of those actions extends to refugees from outside of Yemen who are now effectively stuck in the same conditions that are displacing — but imprisoning — Yemenis. The wars that the United States is carrying out and supporting include wars on the freedom of movement and those who seek to exercise it. From the caging of children and adults at the border with Mexico to the bombing of children in Yemen with American weapons, this summer has demonstrated to the world that the United States isn’t only driving people from their homes — it’s preventing them from escaping to safety. It is significant that U.S. support for the Saudi bombing is getting more critical attention. But from walls to travel bans, our government’s disastrous activities extend beyond the bombings alone. We need to identify and expose Washington’s many attacks on people around the world—and resist them all. Originally published by Foreign Policy in Focus under the terms of a Creative Commons Attribution 3.0 United States license.